With the cost of electricity going up in almost every jurisdiction, consumers would do well to heed the following suggestions as ways to reduce their total electricity consumption and reduce the total cost of electricity as part of their total monthly budget. Several of these suggestions will also help you save money on heating your home if you use oil, propane or natural gas. This amounts to a double savings for many consumers. Here are eight ways to reduce electrical costs for the average home owner. Reduce phantom power – all electronics consume power when the are plugged into a wall outlet. This allows them to turn on quickly when the power button is pressed. Unplug your electronics when not being used and especially when leaving on a vacation etc. Use LED bulbs – consume much less electricity than regular bulbs and even less than fluorescent bulbs. Use a programmable thermostat – use your thermostats timer control to control the temperature in your home while you are away. Also adjust the temperature lower in the winter and higher during summer cooling seasons. “For every degree lower that you set your thermostat, you can save 3 per cent on heating costs”. Dishwashers – if you must use a dishwasher, fill it before running it and only run the dishwasher when rates are at their lowest which is usually at night. Laundry – the same applies to laundry. A full load is more efficient and run the washer and dryer at night or on weekends when rates are often lower. Clothes lines – using clothes lines to dry your clothes is one of the most efficient ways to accomplish this task. No energy used at all. Microwave or toaster ovens vs. electric stove – both devices are far more efficient to cook with compared to an oven. Window and door treatments – seal all windows with weather stripping and use window treatments to provide added insulation or prevent the sun from heating the interior of your home in the summer. For more information about saving money and reducing your electrical consumption, click here. Electricity rates are going up again in the province of Ontario Canada again, just like they are in every other province and state across North America. This recent raise in rates prompted us to write a post about how to reduce your hydro bill. How can you minimize the impact of these rate increases? We cannot do much about the rate increases. We can control how much electricity we consume and keep our electric bills as low as possible. After all I would rather have the money in my pocket. Instead of lining the pockets of the electric company managers and investors. The following are a few ways you can lower your bills. Or at least control how much you pay to some degree. Reduce Phantom Power – use from computers, TV’s, Radios, and other electronic devices. They are turned off, but still consuming power to keep them warm and ready to be instantly turned on. Use LED Bulbs – to reduce the amount of electricity used substantially. Compared to incandescent bulbs and also compared to fluorescent bulbs. Use a Programmable Thermostat – to reduce your energy use when you are not at home or in the evenings when in bed. Run Appliances in Off Peak Hours – Dishwashers, washing machines and dryers are three examples of appliances that should be run during non peak hydro rate periods. Use Microwave – vs. using your oven, particularly in peak periods of electrical rates. These are just a few of the things that can be done to reduce your electrical use, especially during peak rate periods when electricity rates are at their highest levels. Using automation such as electronic thermostats is a great way to ensure that you are always using electricity at lower rates. Many consumers do not correlate the energy they use with the money in their wallets. Over the next dozen years reducing energy consumption will become increasingly important. If if history can be relied on, the price of gasoline is going from $.26 a gallon, too over four dollars a gallon in the last 20 or 30 years. We can fully expect the cost of gasoline to continue to increase. That will drive everything higher including heating or homes, driving our cars, and even the price of our groceries that we purchase. They all take energy to produce and deliver to our homes and stores. This will directly affect our wallets. So reducing energy consumption will definitely be a goal for governments, for cities. Also for the individuals over the next 10 to 15 years and even longer. Many consumers wonder where they should start in terms of reducing energy consumption. It is pretty simple, just look at everything you do. Ask yourself am I using energy that I’m paying for out of my wallet. This includes heating the house, leaving lights on, heating water for showers and baths, and the use of gasoline to drive cars. How many times have you made special trips for an item that could have waited until the next day when you’re driving past that store anyway? Start by turning the air conditioning temperature higher, the heating temperature lower, turning lights off when you’re not in a room. Also turning the TV and other electronic Items off when you’re not using them. Avoid using your car when you could walk or ride a bicycle. Look for energy reducing devices, such as LED lights or fluorescent lights and energy-efficient appliances. Also better gas mileage cars and so on. 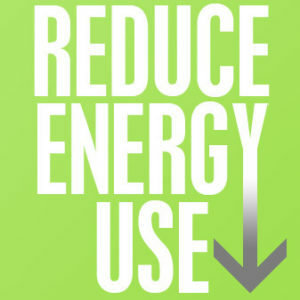 Everything you do and everything you purchase should have the idea of reducing energy consumption in mind. It is amazing how quickly the dollars can add up when you’re saving or reducing your energy consumption. For example if you can turn the temperature on your furnace down by a couple of degrees at night you probably will save two or three dollars a day in reduced energy usage. Over the winter, let’s assume four months, or 120 days. That is close to $400-$500 in savings depending on how much you decrease the temperature and how large home you have. This is just the start in terms of reducing energy consumption and putting more dollars in your wallet. Apply the same approach to turning lights off, washing dishes with a fully loaded dishwasher, washing clothes with a fully loaded wash machine and dryer, reducing your trips by car, walking instead of riding in a car, and combining errands to allow you to make one trip instead of several. Analyze your savings to figure out how much you’re actually saving by reducing energy consumption in your daily life and that of your family. You may be surprised. Many people do not pay attention to reducing electricity consumption at home for a number of reasons. Some just do not have the time to focus on this issue. Others do not realize how much it is costing them because they do not pay the bill each month. Quite a few people also just do not care. They want to be comfortable. Consumers do not want to be bothered by anything like this. They figure that they have worked for their money and they can spend it in whatever way they wish to. There are many people who are on tight budgets and every dollar they can save is a dollar that can go to other more important things like food on the table and paying for kids clothes or whatever is important in life to them. These are the people that should really pay attention to reducing electricity consumption at home and of course those of us who just want to avoid paying companies for services that we do not need. If you have time of day charging, take advantage of the rates and run AC, pumps, dryers etc in off normal time. Take advantage of discount when buying these lights. These are just a few of the ways to ensure that your electrical consumption at home is kept to a minimum and even if you save $300 to $500 a year in electrical charges, the money is better in your pocket than someone else’s. Many people are just not aware of what their electricity consumption is during the day or even during the month. The chart on the left is for one day in June of 2011 for our home. It illustrates a number of things. But before we get into that we need to explain the chart a bit and how it relates to energy consumption. In our city we have time of day billing for energy consumption. The green represents electricity used from 7pm until 7am. Yellow represents two time zones, one from 7 am to 11 am. The other from 5pm until 7pm. 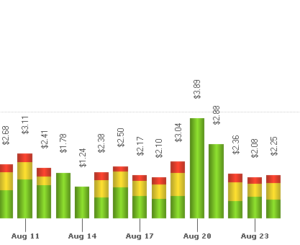 This is the mid level while the green is called off peak usage or consumption. The red runs from 11am until 5pm in the afternoon and is called peak usage time. They charge almost double for energy consumption during the peak times compared to what they charge in off peak times. The idea is to encourage customers to use less power during the day and more at night. It tends to balance out the electrical load between commercial customers and residential customers. We have found that we can reduce our electrical bill a great deal by drying our clothes in the dryer during the evening, shifting air conditioning to the evening hours and generally not using electricity during the day. Many people might take this attitude when they look at the chart and see that they are only talking about a dollar a day for peak hours. However if you multiply this by 365 days and you can save lets say even two or three dollars a day, pretty soon your getting close to a thousand a year that you can save. I do not know about you , but a thousand dollars in my pocket instead of the electrical utility is a lot better in my books! It is not that difficult to save this kind of money compared to doing nothing at all. it is really just getting into certain habits which will not impact your life that much and will save you money. What Do I need to Do to Reduce my Electricity Consumption? It is pretty simple really. First focus on the big consumers of electricity and try to move their consumption from peak or mid peak to off peak hours. Drying and washing clothes, washing dishes in the dishwasher, adding a timer to your pool pump, running your furnace on your home later in the day are all good examples of major consumers of electricity. Anything with a motor or a heating element should be shifted into off peak usage rate hours. Next turn off all appliances that are not in use. If you are not in the room , turn of f the TV set for example. While things like radios and other electronics draw very little electricity, they all draw something, so why have them on if you are not in the room. Same thing with lights. turn them off if you are not in the room. Convert all lights from incandescent to LED or fluorescent lighting and save big time on your usage in this category. 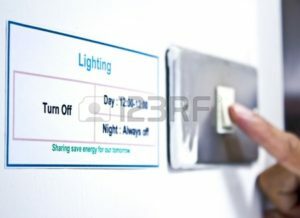 Once you and your family get into the habit of turning off things especially during the day, it will become second nature and you will see the results when your electrical bill arrives. this is extra money that can be used to spend on trips, clothes or whatever your families needs are. Some people just do not want to be bothered about reducing electricity consumption, while others consider it beneath them to even have to worry about something like this. One neighbor really just cannot be bothered. He would rather work and pay his higher bills instead of reducing his electricity consumption. Early we talked about potentially reducing your electricity bill by as much as a thousand dollars. Did you consider how much you need to earn in order to pay that extra thousand. Depending on your income tax rate, you might have to earn as much as $1500 to $2000 in order to pay that thousand dollar bill. I do not know about you, but I would rather put that money to other uses and or work less. Something to think about when it comes to reducing electricity consumption and reducing your overall energy cost. For more electricity reduction ideas, click here. This will be our final post about conserving energy use in the form of electricity. We wanted to show the usage for the past week and show the relative power consumed during on-peak, mid-peak and off-peak hours. 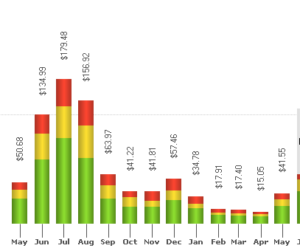 We have saved over $400 on our annual bill for electricity this past year and we are very happy about this. We could probably save more, but there is a certain quality of life that we look for in terms of comfort and lifestyle. Some consumers will not know what the word hydro means. It is a term that describes the generation of electricity by using dams with water driving the electrical generators instead of nuclear power or coal or gas fired plants. But first our chart. This is for a week in August , 2011 when we are running Air Conditioning and a pool pump as well as the usual stuff that you would have in a house. My wife also runs a fan at night in our home in our bedroom as well to move the air around more. For more information, refer to our previous post. One of the things we have learned while doing some research on alternative energy sources is that the payback you get for your time spent and also for the money you are going to spend is greatest when you practice energy conservation. I just received our annual summary of our electrical bill and was pleasantly surprised to see a 22% drop in out total annual hydro cost, while rates went up by 6.8% over that same time period. That’s a total of 29% savings in my books! All you need to do is start analyzing hourly hydro usage and then take the necessary steps to lower the usage during peak rate times. These are real savings and real reductions in energy costs to our household. It is easy to accomplish and the payback is almost immediate without too much impact on the family. Analyzing Hourly Hydro Usage – How did we do that? 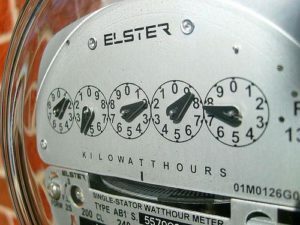 This may seem like an odd post to be included in an alternate and renewable energy blog, however when you think about it, one of the first things you may want to do is to reduce or control the amount of electricity that you use every day before you start looking for other sources of electricity. The subject of this post is how can I reduce the mount of electricity that we use every day. The chart on the left is a graph of our electrical usage. We are on a smart meter system and pay for electricity based on the time of day usage. Green is from 7pm to 7am, while yellow is from 7am to 11am and 5pm to 7pm, and red which is the highest cost is from 11am to 5pm in the day. As you can see in June, July and Aug of 2010 we used a lot of electricity. We were running a pool pump basically 24 hours a day. Air conditioning was operating a lot and contributed to a high cost for electricity during those months. During Feb, Mar and April we were in the sunny south, so the only thing that was using electricity was our furnace, our fridge and security lights that turn automatically when it gets dark, which in the winter time is for almost 14 hours a day. There is a huge difference even from Dec which is also a cold winter month. All TV’s , computers etc were unplugged so there was no trickle draw of electricity. This shows the dramatic difference between usage from different months and the impact of shutting everything down. As mentioned in the previous post, “Reduce Electricity First”, we are talking about our current electrical usage. We want to learn how we can reduce the electricity usage to help us save money. We want to reduce the impact of our usage on the environment. Additionally reduce the need or load on any alternate energy systems that we might be able to use in the future. There are a couple of charts that will help to illustrate how the impact of rates, time of day and the day of the week can affect your total electrical usage and more importantly the final bill. We thought it would be helpful to illustrate the hourly usage from, Monday , June 27th, 2011. This should help understand the impact of various systems and devices that consume electricity in the home. 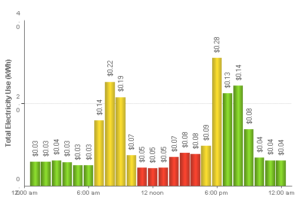 The colors indicate off peak (green – 7pm to 7am and weekends), mid peak (yellow – 7am to 11am, 5pm to 7pm) and Peak usage (red – 11pm to 5pm). This comes from a web site that is provided by our electricity provider. The cost for each hour is also illustrated for reference to show how much power was consumed for each hour. Over night from 12 am to 6 am, all that is running are security lights, the fridge and various devices that are turned off , but plugged in. At 6 am, the pool pump is turned on, the coffee is being made and the TV is on. There is a corresponding jump in electrical usage. Around 10:15, the pool pump is turned off and again the only thing running is the odd light and the TV as well as devices plugged in but not turned on. At 6:30, the evening meal is being cooked, the pool pump is on and some lights are being turned on. After 10:30, everything is turned off except for the security lights and devices that are plugged in but not turned on. This really shows the dramatic impact that managing your electrical usage can have on usage and the associated costs. Although some people are very upset about being forced to use smart meters they really do provide a lot more information. You can learn about how you are using electrical power and when you use this power. With the exception of reducing the time that the pool pump is running we are not really limiting ourselves in any way. Instead we are just managing when we use power to take advantage of the lower rates. 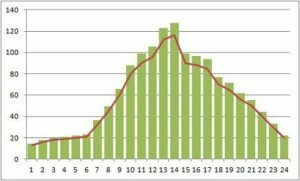 For example peak rates are 18.7 cents per KW, while off peak rates are only 8.9 per KW. This is a significant difference when you add it up for every hour of the day, the week and the year. These rates were updated for Nov 2016. If you are not on a smart meter system, you really only need to be concerned about how much power you use and how you can reduce it. With a smart meter system that measures electrical usage on an hourly basis, you now have a tool that you can use to take advantage of lower rates in the evening and reduce your power consumption even more. Some consumers have also adopted the smart thermostat. This allows the power company to turn your thermostat up to reduce the cost of air conditioning during peak times. This has the dual impact of reducing your power consumption and lowering your bill. While at the same reducing the load on the system which will avoid what is called a brown out or failure of the electrical system. While you are doing this you are not only saving money, you are also transferring usage from peak times to low peak times, which means that the utilities can delay construction of additional capacity. Obviously if only one person does this, there will be little overall impact. On the other hand if millions of consumers follow this approach we can have a serious impact on the construction plans that the utilities must pursue.